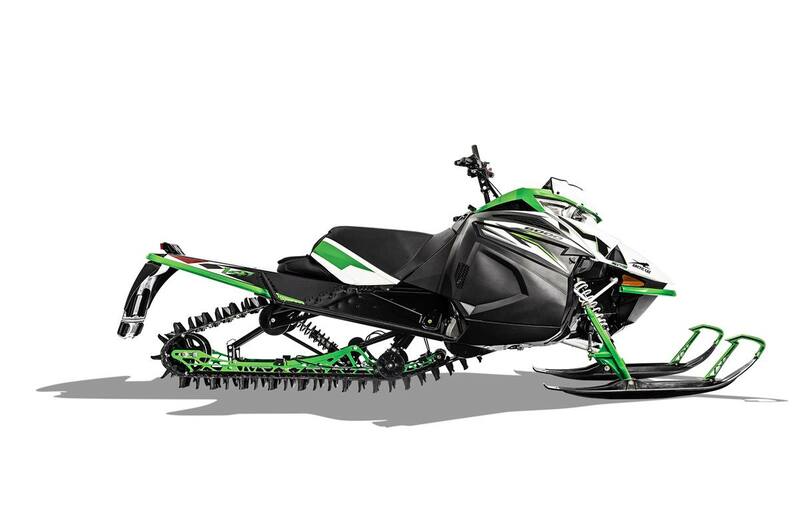 Arctic Mountain Front Suspension with Arctic Cat Gas IFP Shocks: Lightweight, forged-aluminum spindles have less surface area than the previous design, reducing drag and improving performance in deep snow. Also, dual-phase high strength alloy-steel A-arms are lighter than previous designs. Arctic Cat 1.5 IFP gas shocks feature a hard-anodized aluminum body, 0.5" shaft, aluminum internal floating piston, and high-quality seals and ice scrapers. For added strength, the eyelet on the shaft end is forged, replacing the welded design. Float Action Rear Suspension With Arctic Cat IFP 1.5 Shocks: The FLOAT-ACTION rear suspension’s unique tri-hub rear axle system is engineered to be very light and very strong. The Arctic Cat 1.5 IFP coil-over shocks provide preload adjustment and are proven on the hill for reliability and stability. 141-in. and 153-in. Power Claw Track with 2.6-in. Lugs: The one that sets the standard for deep snow performance. Available in 15" x 141" x 2.6" or 15" x 153" x 2.6", this track features stagger-set, curved-forward paddle towers that won’t fold over or take a set.